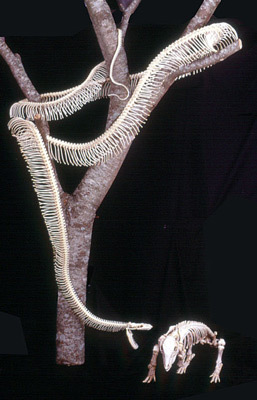 The skeleton of this 5.8 m (19 foot) Reticulated Python was assembled by Patrick Couper in the Queensland Museum's Herpetology Section. This skeleton, now on permanent display at Australia Zoo, took six weeks to prepare and involved drilling 1278 holes and wiring on 636 ribs. The snake was a long term resident at Australia Zoo and died of natural causes in 1995. Both the snake and pig skeletons were prepared using the techniques in the menu above. The snake was skinned and the gut removed. Then the bulk of the muscle tissue was cut away from the backbone. The snake carcass was then cut into manageable-sized pieces, each about 60 cm long. This was done carefully to avoid damaging the ball and socket joints connecting adjoining vertebrae. Wire was threaded through the vertebral canal of each section, to ensure the vertebrae stayed in order as the remaining meat was removed. The carcass was then air-dried. The dried carcass was placed in a box housing a colony of dermestids (flesh-eating beetles and their larvae) which ate away the remaining meat and reduced the carcass to bare bones. It was checked daily and removed before the ribs fell away from the backbone. Dermestids like to be dry and warm, and kept in a dark place. The litter created by these insects (shed skins and faeces) can trigger allergies in some people. It is important to avoid inhaling this material, or touching it with bare skin. Gloves and a mask should be worn at all times when dealing with these insects. The pig skeleton in this exhibit was also prepared in a dermestid colony. Click here to watch these flesh-eating insects in action. Once the skeleton was removed from the dermestid colony, the ribs were gently pulled away from the backbone and placed in order on a styrofoam sheet. Each rib was secured with stainless steel entomology pins. It was essential to keep the ribs in order and to know where the ribs attached along the snake's backbone. This helps with the final positioning of bones. The skeleton was now ready for bleaching. The foam sheets to which the ribs were pinned were then weighted (any heavy, non-metal object) and placed in a suitable container. The corresponding section of backbone was kept with the ribs throughout this process. A bleaching solution was gently poured into the container to avoid dislodging the ribs. Care should be taken at this stage to avoid skin and eye contact with the bleaching solution. The process should also be carried out in a well-ventilated area. It is best to use a weak bleaching solution and continue the process over an extended period (up to 24 hours). Strong solutions can damage the bones. This skeleton was bleached in a tub of hot water to which sodium perborate (NaBO3. H2O) was added at a ratio of 1 cup to 10 litres of water. When the bones were well-bleached, they were removed from the sodium perborate solution and any remaining flesh or cartilage was removed with a scraper. The bones were then soaked in clean water for 24 hours to remove all remaining traces of bleaching solution. The ribs were attached to the backbone by small, non-corrosive wires. A small hole (1 mm or less) was drilled through the head of each rib and the corresponding attachment points on each vertebra. A short wire was threaded through these holes, connecting each pair of ribs to its associated vertebra. The ends of each wire were twisted together with a small pair of pliers. It is necessary to ensure that the wires are not over-tightened. Retaining movement is important in the final positioning of the skeleton. When all the ribs were attached to the backbone, each vertebra (except those of the tail) was threaded, in order, onto a strong wire that was slightly longer than the overall length of the snake. The wire is positioned centrally through the spinal canal. The tail vertebrae were threaded, in order, onto another smaller gauge wire. Only three vertebrae at a time were threaded on to the wires. Every third vertebra was locked into place with small wooden chocks that were packed tightly into the vertebral canal (small pieces of bamboo meat skewers are ideal). The tail and body wires were then joined together leaving enough wire protruding forward from the neck to attach the skull. A suitable base was required (in this case, a log, fumigated and frozen to kill wood-boring insects). The skeleton was draped over this in a life-like pose and fixed in place with small lengths of monofilament line. Alternatively, attachment points can be made with short lengths of wire. The ribs are positioned to follow the curves of the vertebrae. Ribs on the inside of a curve are closer together than those on the outside of the curve. Each rib is held in place with a small drop of instant adhesive. This must be done in a well-ventilated area, or with a protective mask. The attachment points were then strengthened with PVA wood-working glue. Lastly, the skull was attached to the skeleton. The neck wire was cut so that it fitted neatly into the cranial cavity. Then a small loop was made at the end of the wire. The cranial cavity was filled with a clear silicon sealant and the skull placed in its final position. The skull must be held firmly in position until the sealant dries. Once the sealant has fully set, the skull cannot be repositioned. The finished skeleton should be housed in a display case where it is protected from dust and insect attacks. The Skull of a Coastal Taipan, Oxyuranus scutellatus, in full strike mode. The above procedure can be used for the preparation of most skeletons but may require minor modifications. For instance, the rat skeleton below was bleached in cold water and a weak hydrogen peroxide solution (3%). This ensured that the bones remained articulated throughout the procedure and that the cartilage of the rib cage was preserved. Cartilage is prone to shrinking and distortion. To prevent this, the thoracic portion of the rat skeleton was soaked overnight in 70% ethanol and then again in absolute ethanol before final drying. This removed moisture from the cartilage and prevented excessive distortion as the skeleton was air-dried. Leaping rat prepared for a new exhibit at the Queensland Museum. Skeleton of Mary River Turtle, Elusor macrurus. Fauna is protected under wildlife legislation and regulations and permits may be required to collect either living or dead specimens. Advice on this matter should be sought from your local wildlife authority (for example, Queensland Parks and Wildlife Service).